In 1851 a twenty-year-old named John P. Roane crossed the Atlantic to America from County Galway, Ireland. With him was a brother, Patrick Roane, and a sister, Hannah Roane, all lived and worked for a time in the bustling industrial city of Lowell, Massachusetts. Patrick and Hannah both spent time working as operatives in the world-renowned textile mills. Patrick took a wife and daughter to Iowa in 1856 to farm land lately cleared of Native American inhabitants. John owned a grocery business at the corner of Gorham and Summer streets, where he also housed his wife Mary (Hurney) and five children between 1860 and 1869 when he died at the age of 38, most likely, of the tuberculosis that carried his sister Hannah off in 1866. A lot of happened in that span of time. Babies were born and babies died. The very nation went to bloody war with itself. John struggled to maintain his business and his family in failing health. He left a legacy in Lowell, but he died in a place called Colmanstown in County Galway, where he, and his siblings were probably born. The family portrait above was taken around 1913 and centers on Irish immigrant, Mary Hurney Roane O’Neil who survived two husbands and seven of the eight children she bore. Behind her stands John F. Roane, Senior (1861-1942), a letter carrier for 40 years. His wife, Mary Josephine Donohue, died in 1900 and the eldest child, Mollie Roane (1890-1980), became mother to these five boys. Standing: James P. H. Roane, Senior (1895-1960); George E. Roane (1897-1961); Paul J. Roane (1891-1944). 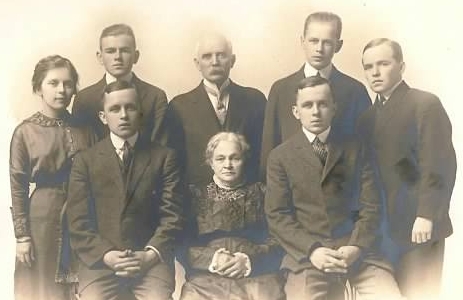 Flanking their grandmother are twins, John F. Roane, Junior (1893-1941) and Francis “Peach” Roane (1893-1942). Missing from this group is Mary’s other grandchild, William Samuel Robinson (1896-1958), son of Sarah L. Roane (1868-1899) and William J.Robinson (1868-1932). Well done a superb page. Let us know if you need a hand going through the Tithe or the Griffith Valuation…I see what I think are ‘your’ Ruanes on both. Laura Roan, Hello Cousin, I am John, My Grandfather was Pete Rowan your Grandfathers Brother. We may have met at a Rowan/Roane reunion in Melrose in the 1980’s. Poorirish (we have traded emails in the past) please forward my contacts to Laura. Patrick’s brother, Edward is my G-grandfather. They were indeed in Burlngton, IA for a time after leaving Massachusetts (hoping to get work with the RR I believ). When they moved west to Monroe County, they farmed. The land in Lucas County was right on the County line with Monroe County. Edward’s home place was due south of the Irish settlement of Georgetown in Monroe County. He was widowed and eventually remarried. When he died, the land passed to his second wife and my grandfather’s brothers had to go to Indiana and Chicago to find work in the steel mills. Edward and Patrick help quarry the stone and construct the St. Patrick’s Church there. The Roans have had the same family pew (front left) for 152 years. The church is on the National Registry of Historic Places. Thank you for an excellent rundown of your Iowa Roane/Roan clan! The 1856 Iowa State census taken in Burlington, Des Moines County, suggests Patrick and Mary were in Iowa a bit earlier. Their second child, son, James Bernard Roan, was listed as born in Iowa and 1 year of age. Additionally, Patrick and an Edward Roane (Brother? Cousin?) purchased adjoining 80-acre parcels from the US government in Chariton, Lucas County, on 3 June 1856. — Are there any stories of the early days that were passed down? HELLO I AM GERALD ROANE THE SON OF JOHN F ROANE THE 3RD OF LOWELL MA. I AM ONE OF 8 FAMELY MEMBERS AND I DO NOT KNOWN MUCH OF MY BACK GROUND BUT I DID HAVE AND AUNT MOLLIE AND UNCLE PAUL WHO WAS FROM MAINE.